Similar to a project template, you can create a template for your task and task lists and use them whenever you create similar work in the future. The main use of a task template is that it allows you to save your task lists and its related tasks so that you can reuse them in your project. Certain businesses carry monotonous work, where employees will be assigned to the same set of work in periodic cycles. Recurring work can sometimes be daunting; to save your time and effort having a template can help the team in managing their work effectively. Click here to learn more about access privileges for Task Templates. Michalle runs an event management company, where he has signed a new contract for a wedding celebration. What does he do to manage the entire event? First, he creates a project named 'John and Celina Wedding Planner'. Second, he lists out all the possible plan right from decoration, music, costume, food etc. as task lists. Third, for every tasklist, he creates different tasks (Task list - Decoration and Tasks - Lighting, hallway, reception, pillars). Fourth, for every task, he creates different subtasks (Task - Outdoor and Subtasks - Floral, chalkboard signage, family photo wall etc.). For every tasklist, he creates relevant tasks and subtasks accordingly. At the end, he is done with his project. The next time, he gets another wedding contract. Instead of recreating the same plan 'n' number of times, he can reuse the previous task list as a template for the upcoming wedding events. This is where a task template helps his team manage time effectively. Select Templates in Portal Settings and click Add Task List Template in the upper-right corner to add a new task list template. Hover over the desired task list template to edit, click and then choose the required option to perform the edit and delete actions. Navigate to and then choose Templates in Portal Settings. 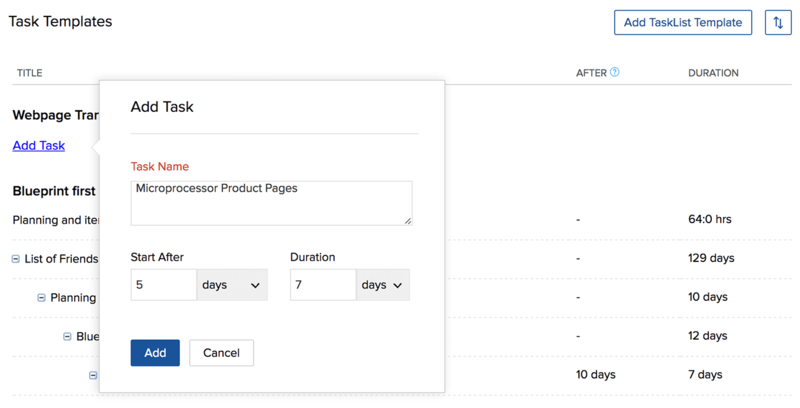 Click in the upper-right corner next to the Add Task List Template to reorder the task list templates. And, click Save Task List Templates Order to save the order of the task list templates. Select Templates in Portal Settings to view all the task list templates in your project. Hover over to the desired task list template and click Add Task to create a new task template. While adding task templates you can choose to start the tasks after a few days, weeks, months or even hours after the project start date. However, the hrs option is displayed in the task's Start After field, only if you've set your Task Duration in hours in your Module Configuration found right within your Portal Settings. Hover over the desired task to edit, click and then choose the required option to perform the edit and delete actions. If you want to add a subtask to a task template, just hover over the required task and click and select Add Subtask to create a subtask to the respective task template. Click Reorder found right next to the Add Task to reorder the existing task templates.